Marshes provide many important ecological services and functions and are habitat to many species. Marshes can be contaminated by spills on water, as well as by pipelines crossing under, through, or adjacent to marshes. When an oil spill affects these habitats, impacts can be severe; however, impacts from inappropriate response methods can increase these impacts and slow overall recovery. The report, Oil Spills in Marshes, is intended to assist those who work in spill response and planning where fresh and salt marshes are at risk of oil spills. 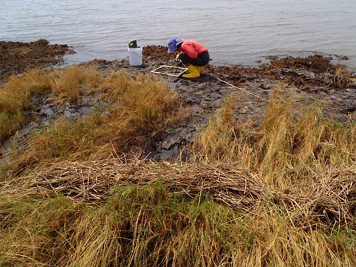 By understanding the basics of the ecology of marshes and learning from past oil spills in marshes, we can better plan for, protect, and make appropriate decisions for how to respond to future oil spills. The report is the fourth in a series of spill response publications prepared by NOAA's Office of Response and Restoration. Other publications in the series include these reports on oil spills and specific warm-water resources: Oil Spills in Coral Reefs, Oil and Sea Turtles, and Oil Spills in Mangroves. Oil Spills in Marshes was jointly published by NOAA's Office of Response and Restoration and the American Petroleum Institute. Download the Report: Oil Spills in Marshes: Planning and Response Considerations [PDF, 4.8 MB]: Published September 2013. Barge Florida, Buzzards Bay (West Falmouth), Massachusetts, September 1969: This video, produced by The New York Times, discusses the oil spill "most closely monitored in history." Scientists have used it to understand the long term impacts of oil on coastal ecosystems. Amoco Cadiz, Brittany, France, March 1976. Chalk Point (Swanson Creek Marsh), Patuxent River, Maryland, April 2000. Deepwater Horizon, Northern Gulf of Mexico, 2010. Responding to Oil Spills in Coastal Marshes: The Fine Line Between Help and Hindrance [PDF, 102 KB]: A 1995 report describing the advantages and disadvantages of seven cleanup methods for oiled marshes: natural degradation/no response; vacuum/pumping; low-pressure flush; vegetation cutting; burning; bioremediation; and sediment removal/replanting.